Drunk driving is, of course, utterly intolerable. It is a preventable action with the potential for tragic consequences. Unfortunately, such explicit negligence poses a dangerous reality for our roads. And in the case of such a horrific event, the drunk driver must be held accountable for their careless actions. If you or a loved one is faced with the devestation of a drunk driving accident, please do not hesitate to reach out for legal guidance. You may be eligible for compensation for the losses you endured. It may not only be the intoxicated individual behind the wheel who is at fault for a drunk driving related accident. It may be that other parties, such as a bar, restaurant or another facility wrongfully provided alcohol to a visibly intoxicated person. 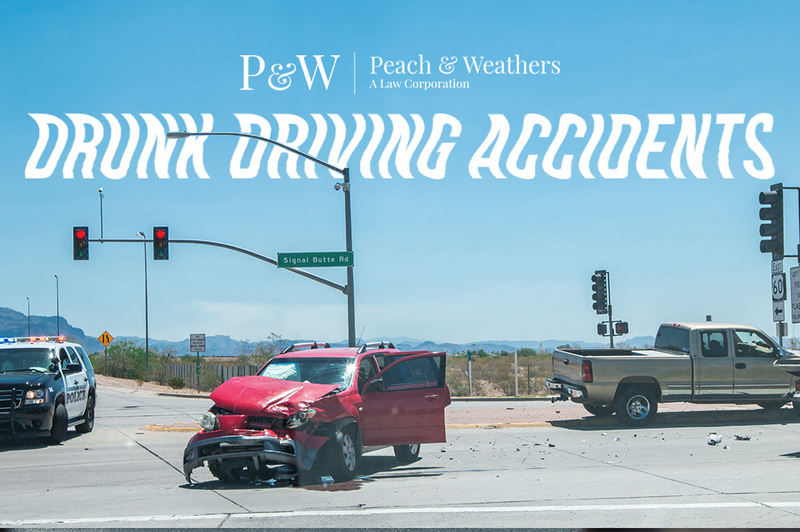 In this case, we at Peach and Weathers are prepared to investigate the circumstances of a drunk driving accident thoroughly. If you have experienced injury in a drunk driving accident, you ought to be compensated adequately and according to the losses you’ve faced. In order to pursue a lawsuit, you must be able to provide a few essential items. Prove the intoxication level of the driver at fault. In pursuit of this type of case, it is important that you have legal guidance on your side. Please be sure to seek expert counsel to assist you in this challenging time. Reach out to Peach and Weathers for 60 years of combined experience working with such cases.